Domopalooza is 13 days away. 13 days! The event is shaping up to be unlike any conference you’ve ever been to. (Professional learning all day long and entertainment like Robin Thicke, Ludacris and Kid Ink all night long). If you need some help convincing your boss it’s worth your time (and theirs) to send you to Domopalooza, here are a few tips. The best and brightest minds in data, analytics and business management are attending. Not only will you learn from world experts like Sheryl Sandberg, Billy Beane, Jer Thorp, Rita Sallam and Josh James, you’ll learn and network with experts from big brands such as National Geographic, NBC, NFL, Stance, Mattel, Gaiam TV, POSSIBLE, SAB Miller, Rakuten, Sage North America and more. Where else will you get this kind of access in such a sort amount of time? For that reason alone, it’s worth attending. 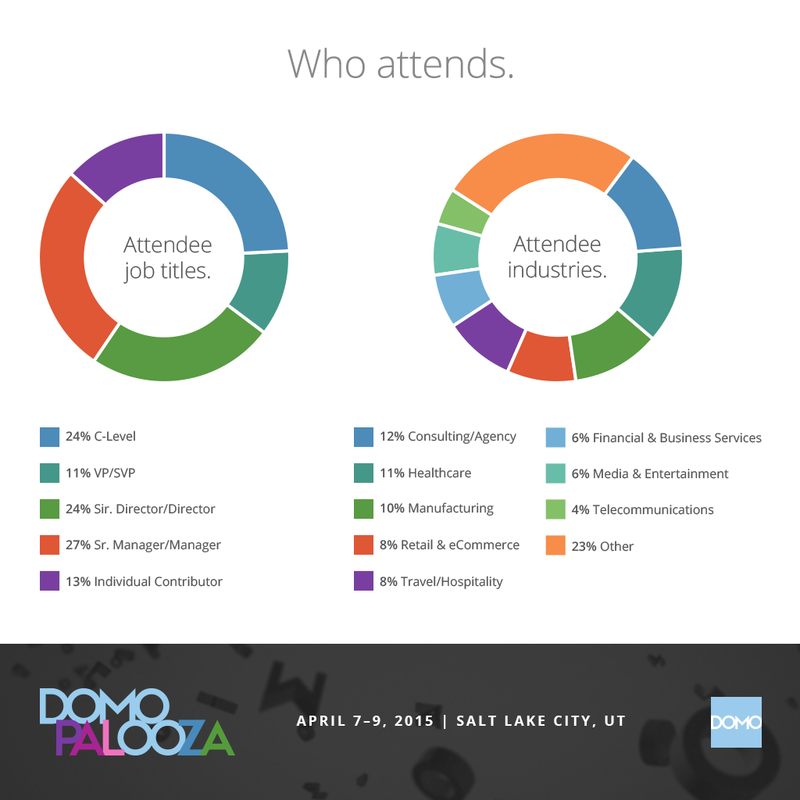 A breakdown of registered attendees for Domopalooza 2015. Domopalooza is really three conferences in one. It’s a conference where you’ll get hands-on workshops to help you get more out of Domo, a chance to learn from industry experts, and an opportunity to hear what’s next in analytics while experiencing new ways to think about managing your business. It’ll be nearly impossible to come back without some valuable takeaways. This is a unique chance to receive a master’s course in BI, analytics, data visualization and business management — all in a few days. I know people who set goals before every show. Whether it’s to learn how to build your own business management dashboard or to meet five new people who you can continue learning from for years, goals are important. Make a plan of all the sessions you’ll be attending, all the people you’d like to meet and what your main objectives will be at the conference. With a plan like that, you’re showing that you’re serious about using this conference to become a more valuable asset to your company. If all else fails, pull out the old honesty card. Tell them you want to party with Grammy Award winners, learn from the best and brightest minds around, and experience the greatest snow on earth. Who knows, maybe if you sell that last point well enough they’ll want to come with you (I’ll let you decide if that’s a good thing or not). Also, like any good sale, the sooner you make the decision, the better. Sign up now and snag some early-bird savings. Trust me, this isn’t something you’ll want to miss.